Nairobi, May 8, 2017…….Six people, among them a Kenya Power employee, were arrested in various parts of the country over the weekend as the Company enhanced crackdown on illegal lines and theft of power distribution equipment. Nairobi, March 20, 2017…..Kenya Power has confirmed that 5.9 million customers have been connected to the grid to date through ongoing government-led national electrification programmes. Nairobi, March 9, 2017…The Principal Secretary, State Department of Energy, Dr. Eng. Joseph K. Njoroge has today officially launched the third edition of the Energy Journalism Excellence Awards (EJEA). 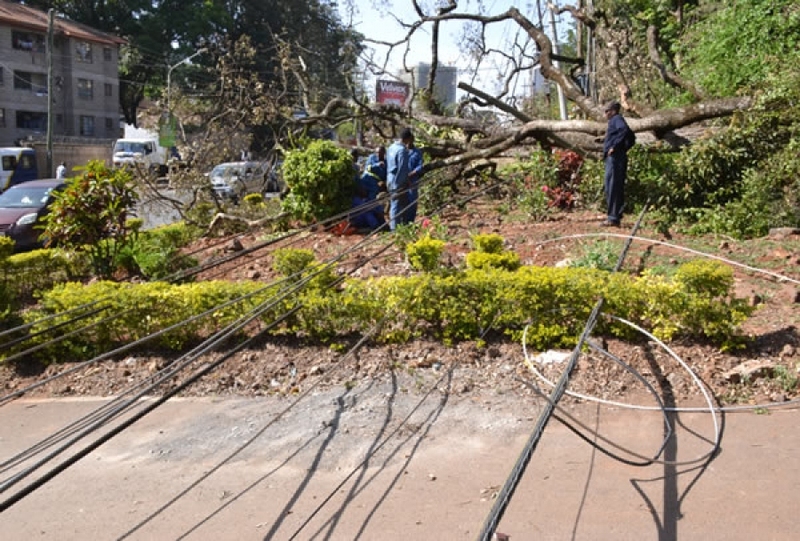 A tree this afternoon fell on a power line in the Westlands area of Nairobi affecting power supply on Rhapta road, Riverside Drive and parts of Kileleshwa area. Fallen tree that damaged power line in Westlands affecting power supply on Rhapta road, Riverside Drive and parts of Kileleshwa area. The Kenya Power Board of Directors is pleased to announce the appointment of Dr. Ken Tarus as the Acting Managing Director and Chief Executive Officer of the Company with effect from today (4th January 2017). Nairobi, December 7, 2016……. Thirteen prepaid and four postpaid meters were recovered at Tulienge, Namang’oflo, Machakha and Kibindoi areas within Bungoma County, in an operation carried out by Kenya Power security team. Kenya Power switches to Kenyan meters and transformers to boost manufacturing. Nairobi, November 17, 2016………Kenya Power spent Sh6.2 billion in purchase of locally manufactured goods in the first quarter of 2016/17 in line with the Buy Kenyan Build Kenya Initiative meant to promote the manufacturing sector. Nairobi, November 9, 2016…….A total of 23 people have been arrested in the last one week, largely for engaging in illegal electricity connection. Kitui and Kikuyu areas recorded the highest number of arrests at 12 while Kisumu and Kakamega were second with seven arrests. Nairobi region recorded two arrests while there were single arrests in Central Kenya and North Rift regions during the period. “We will continue carrying out a countrywide crackdown on all unauthorized power connections to clean up the network. Those who will be found culpable, including the beneficiaries, will face the full force of the law,” said Kenya Power’s acting manager for security services Major Geoffrey Kigen (Rtd). He added that customers should make all payments for electricity connection at Kenya Power offices and report any suspicious activity to the nearest Company offices, police and provincial administration. Illegal power connections often result in loss of funds to beneficiaries once the lines are identified and recovered, thus denying them electricity supply. In addition, they undermine the quality of power supply as they overload the distribution network, resulting in outages. Illegal lines also pose danger of electrocution to beneficiaries as they are often not constructed as per the required standards. Among those arrested is a Kenya Power employee attached to the Kitui office, who was nabbed constructing an illegal line at Kabati Township. Kenya Power is currently implementing the Government-led Last Mile Connectivity Project, which seeks to connect customers at Sh15,000 for single phase meters, to accelerate the country’s rate of access to electricity to 100 per cent by 2020. Major Kigen warned that criminals have taken advantage of the nationwide electrification project to con the public posing as Kenya Power staff. He urged people seeking electricity connection to get information about the project from Kenya Power offices around the country to avoid being hoodwinked by fraudsters. In the last three months, Kenya Power has arrested and prosecuted 113 suspects for various crimes including illegal connections and vandalism. Some cases are ongoing, while others have been fined up to Sh5 million or a ten year jail term in default of the fine. Kenya Power Corporate Communications Dept. Nairobi, October 25, 2016…….A man has been fined Sh5 million by a Bungoma court for carrying out illegal electricity connection, boosting Kenya Power’s efforts to track down theft of electricity. Geoffrey Kiberenge was arrested in Bungoma on October 19 and booked in Bungoma Police Station before appearing in court. He will serve a 10 year imprisonment in default of the fine. Elsewhere in Coast, two suspects; Nathan Wasike and Paul Akuto Okech were arrested in Likoni yesterday for being in possession of KPLC labelled climbing irons. They were booked in at Likoni Police post and are expected to appear in Mombasa law courts. In Ruaraka, Jacob Abade Anywaya was arrested for impersonating Kenya Power staff and engaging in unauthorized electricity connection exercise. The suspect has been linked to a number of unauthorized connections and retrofitting of meters in Roysambu, Githurai 44/45, Eastern Bypass and other areas within Ruiru. A fake staff ID card, KPLC branded twist seals, clamp meter and an inspection report booklet were recovered from the suspect. In the last two weeks, 60 people have been arrested countrywide and charged in court for various offences, mostly illegal connections, following concerted efforts by Kenya Power security personnel to crack down illegal connections, unauthorized reconnections, vandalism and theft of electricity. “Illegal connections undermine the reliability of power supply as they overload the distribution network and result in unplanned outages and may cause injury or death,” Kenya Power MD & CEO Dr. Ben Chumo said . “In addition, victims of such exercises are exposed to unsafe electricity connections and suffer financial losses once the illegal lines are discovered and destroyed”. “We urge our customers to make all payments for electricity connection at the Company’s offices, request for reconnection after disconnection and report any suspicious activity to our nearest offices, to the police and provincial administration,” Dr Chumo said. Nairobi, October 4, 2016…….Transformer suppliers will be required to adhere to new guidelines as KPLC moves to arrest vandalism and improve the quality of power supply in the country. The new specifications are envisioned to increase durability of transformers while making them less attractive to vandals. Under the new guidelines, transformers will contain aluminum windings, as opposed to copper which is attractive to vandals. The requirement is expected to control the quality of transformers while at the same time prevent vandalism. Suppliers will also be required to provide a list of critical raw materials and their sources in order to ease traceability of parts and control the quality of the equipment. In addition, the guidelines require that a supplier provides a warranty of six years and five years from the date of delivery and commissioning respectively. This will help reduce transformer failure rates and compel manufacturers to take responsibility for any manufacturing defects. “This is one of deliberate steps being undertaken by the company to ensure that we offer the best service to our customers. In the past, the challenge of vandalism has adversely affected our business thus calling for innovative ways of tackling that problem,” said Kenya Power’s Managing Director and CEO Dr Ben Chumo. Dr Chumo added that “by requiring transformer manufacturers to reveal their source of raw materials, the company will be in a position to avoid low standard equipment that could compromise the efficiency of the network”. The new requirements are expected to contribute to improving the quality of power supply by reducing outages resulting from vandalism. Recently, Kenya Power also signed a MoU with Toshiba Transmission & Distribution Systems (India) Private Limited (TTDI), subsidiary of Toshiba Corporation, for pilot installation and trial of new type of transformers with the aim of enhancing efficiency and helping to significantly reduce distribution losses. Internal analysis by Kenya Power shows that cases of transformer vandalism have been on a decline, helped by constant surveillance on the network, enhanced penalties and jail terms for vandals and deployment of other innovative measures to track down the vice. Last year, 222 transformers were vandalized resulting into a loss of Sh86 million to the Company compared to 268 transformers vandalized in the previous year, costing Sh100 million. From July to date, 33 transformers have been vandalized, compared to 50 in the same period last year. There are about 59,000 transformers in the distribution network at the moment. This figure is expected to rise significantly with the implementation of the Last Mile Connectivity Project, part of which involves increasing the number of transformers.